Humor - Indoctrination for Return to U.S.
will be available for purchase by mail Prints are 20" x 24"
SHOULDER PATCH: The patch is circular in shape and is divided diagonally into a field of grey and black. The Arabic number 9, in black, is superimposed on the field of grey and the Arabic number 4, in grey, is on the field of black. 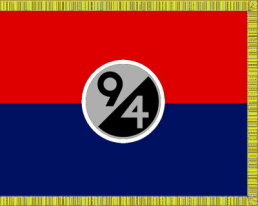 ACTIVATION DATE: 15 September 1942. 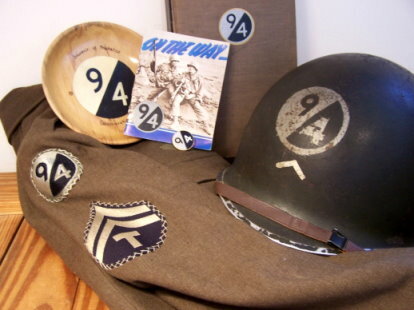 INACTIVATION DATE: 9 February 1946 at Camp Kilmer, New Jersey. COMPONENT UNITS: 301, 302, and 376 Inf Regts; 94 Cav Rcn Tp (Mecz); 319 Engr Combat Bn, 319 Med Bn. Div Arty: 301, 356 and 919st FA Bns (105 How) and 390 FA Bn (155 How). Sp Tps: 94 QM Co, 94 Sig Co, 794 Ord Co (LM), Hq Co, MP Plat and Band. 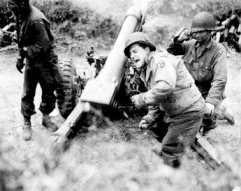 TRAINING UNDER ARMY GROUND FORCES: The division was activated for this war at Ft Custer MI but soon after activation moved to Camp Phillips, Kansas. 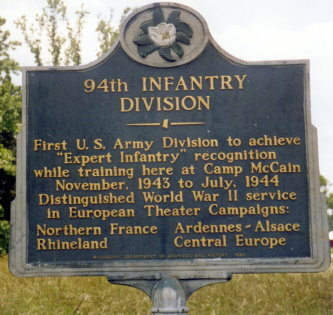 In July 1943 the 94th participated in maneuvers in Tennessee, under the Second Army. 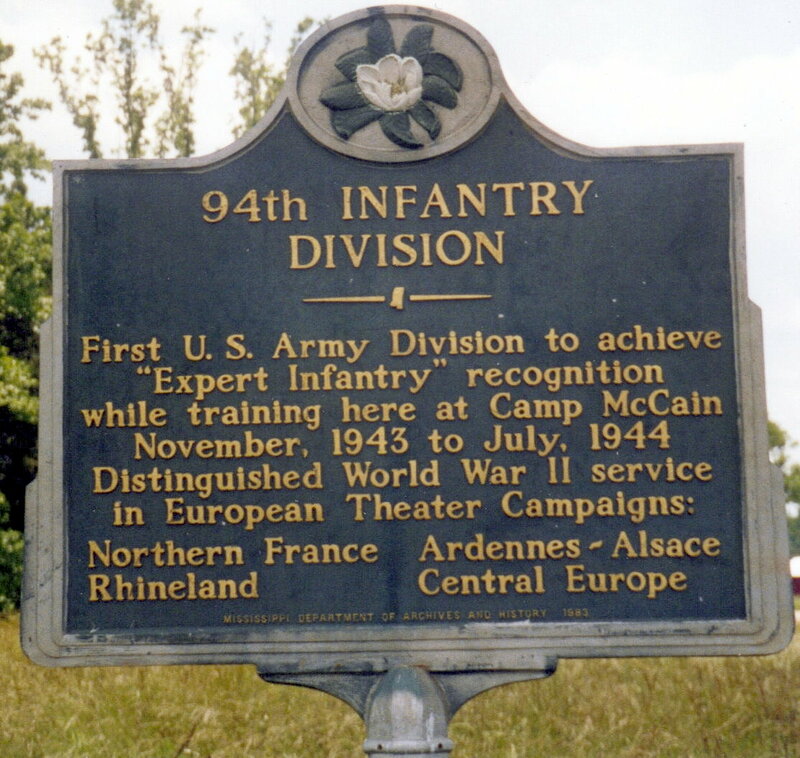 In December 1943 the unit moved to Camp McCain, Mississippi for final training. DEPARTED U.S. FOR FOREIGN DUTY: 6 August 1944. OVERSEAS TRAINING: Trained briefly in England prior to leaving for the continent. 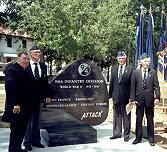 DATE ENTERED COMBAT: Division 17 September 1944, First Elements 10 September 1944. RETURNED TO U.S.: 6 February 1946. BATTLE CREDITS: (Division) Northern France, Rhineland, Ardennes, and Central Europe. SUCCESSIVE COMMANDING GENERALS: Major General Harry J Malony from September 1942 to May 1945; Brigadier General Louis J Fortier from June to July 1945; Major General Allison J Barnett from 1 August 1945 to inactivation. 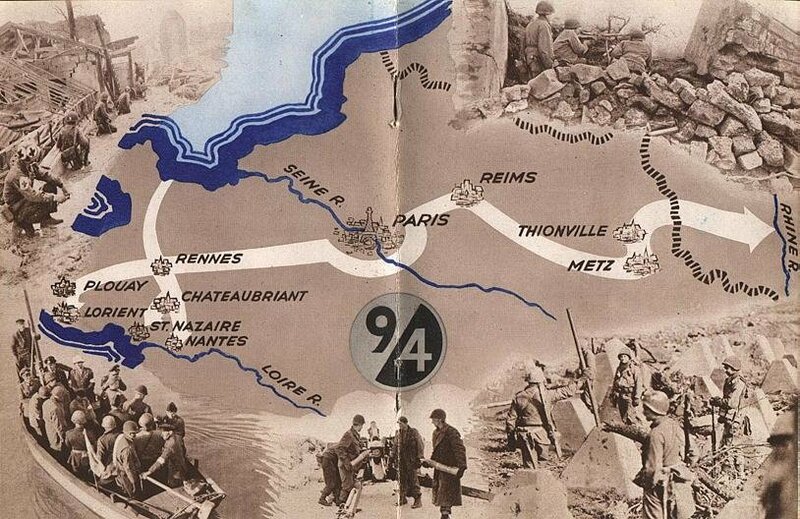 COMBAT HIGHLIGHTS: The division went into action in September 1944 in the Lorient and St Nazaire sectors, with the object of containing some 60,000 Germans in those submarine ports, well protected from aerial bombardment by flak guns and concrete emplacements. 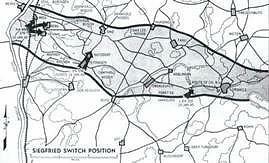 The division had to cover 450 air line miles of front and was faced constantly with the threat of an attempt by the Nazis to join the two pockets. However, when the 94th finished 111 days of combat in Brittany, the two pockets had been thoroughly pinned up. Blain and several other French towns had been liberated and 29 battalions of French Infantry had been trained and equipped to help fight in the area. 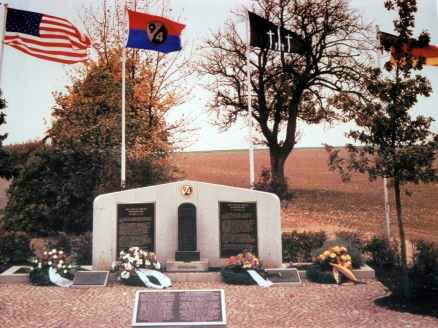 In addition, numerous Germans had been killed and three exchanges of prisoners of war effected. 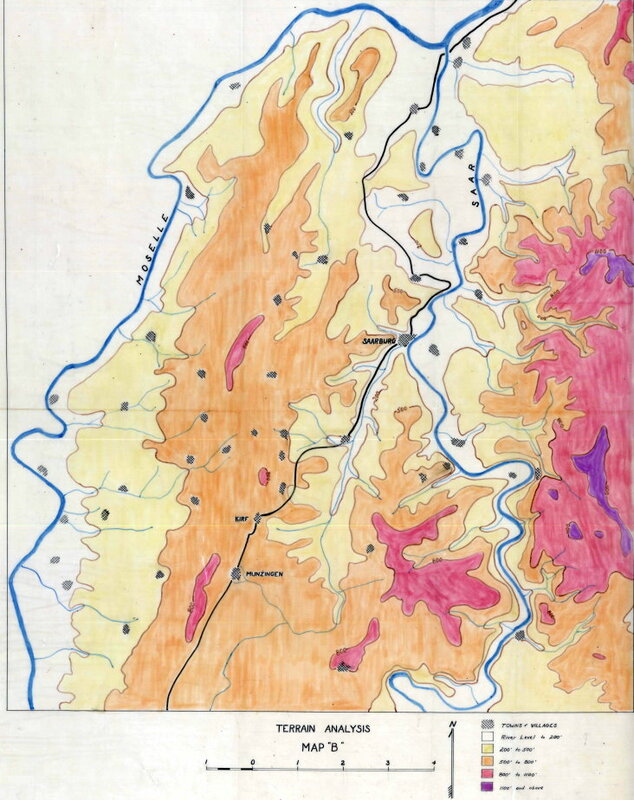 In January 1945 the division moved to a section southeast of the city of Luxembourg where the Germans had thrown up what became known as the Siegfried Switch Line to protect the bulge of the German border. And to act as a buffer to the main Siegfried Line east of the Saar River. 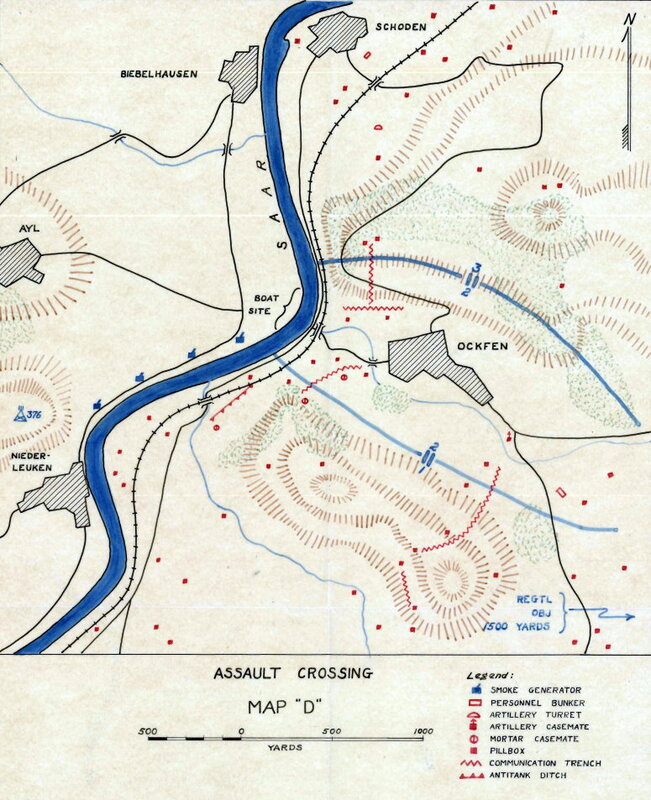 Taking up positions along the Moselle River, the division, now part of the Third Army, began to probe for possible routes for an all-out offensive. 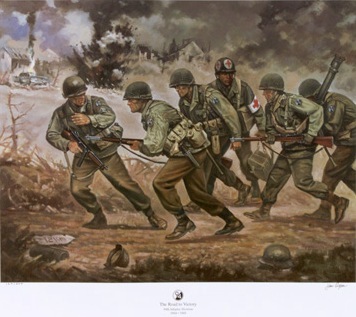 On 14 January the 94th captured Tettington and Butzdorf and in the next three days made the first crack in the Switch Line by grabbing Nennig, Wies and Berg. In February the division began the job of clearing out the Campholz Woods. 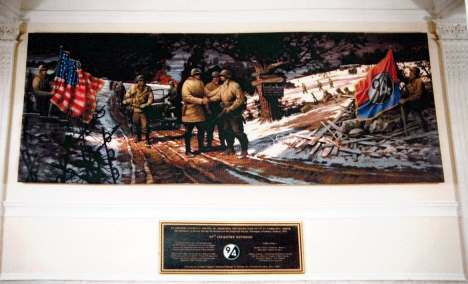 On 7 February after the woods had been gained the 94th took Sinz in a bloody action. 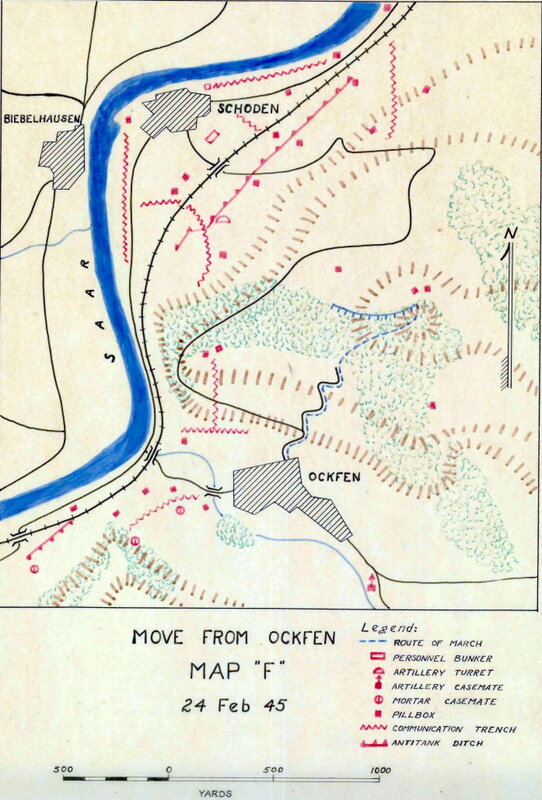 It went on to strike east through Adenhelz Woods, Munzingen and Keblingen fell to the Infantry, as well as Oberleuken and Faha. The division now swept aside all opposition as it headed for the Saar. 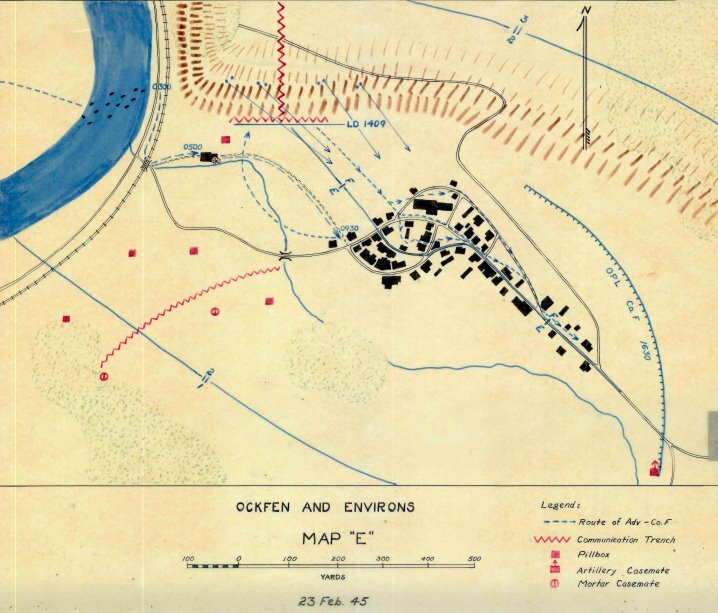 By the latter part of February the 94th helped clear the west bank of the Saar and on 22 February threw up bridgeheads across that river preparatory to smashing the defenses of the Siegfried Line on the opposite side of the river. 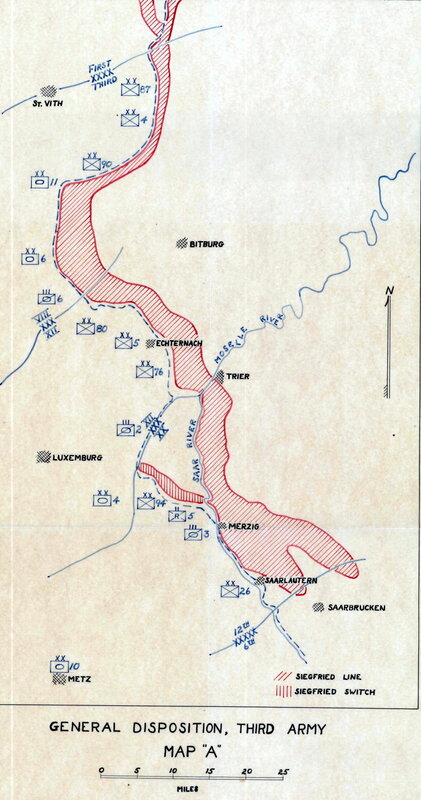 By early March the 94th had consolidated its gains across the Saar and on 16 March was given the job of spearheading the Third and Seventh Armies drive to the Rhine. Eight days later the division was at the river. It had taken the prize industrial city of Ludwigshaven and had run its total of prisoners up to 17,000. 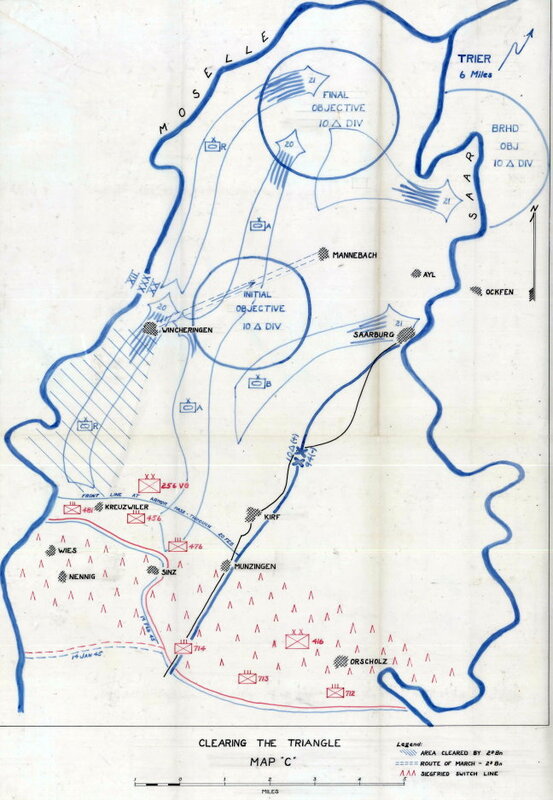 Upon conclusion of its Rhine offensive the division was sent to XXII Corps, 15th Army to Krefeld area and operated on the southern tip of the Ruhr pocket. 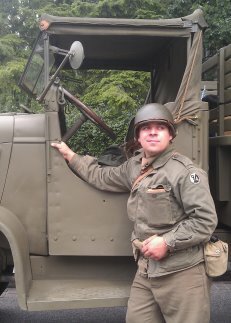 It occupied the Ruhr after V-E Day with Headquarters in Dusseldorf. 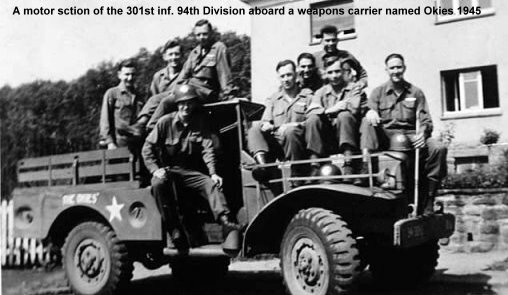 Elements of the division began arriving in the US early in February 1946, and the division was subsequently inactivated. These fact sheets are from The Information Section, Analysis Branch, Hq Army Ground Forces, Washington 25 DC, 1 Mar 1947, as found in the records of the National Archives and Records Administration, RG 407, Archives II, College Park MD. Not all of the Division’s Fact sheets have survived and they are being presented here in random order as new ones are found.